The Talberts (Charlie, Don, and Diron) were a family line that infused the University of Texas during the 50s and 60s with raw talent. 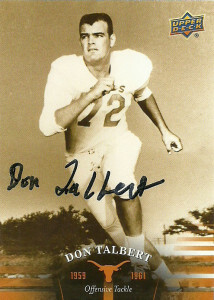 Don Talbert, the eldest of the clan, 6’5″, 210, was a two way star playing both offensive line and defensive line for the Longhorns from 1959 to 1961. He was a co-team captain and earned All SWC and All-American Honors after the 1961 season. Don was selected by the Dallas Cowboys in 1961, where he played both sides of the line. 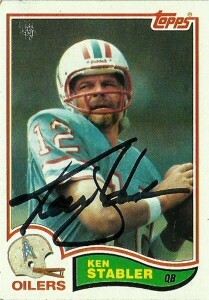 (He was also selected in the 34th round of the AFL draft by the Houston Oilers, but declined their offer.) After serving 2 years in Vietnam, he returned to the Cowboys in 1965. 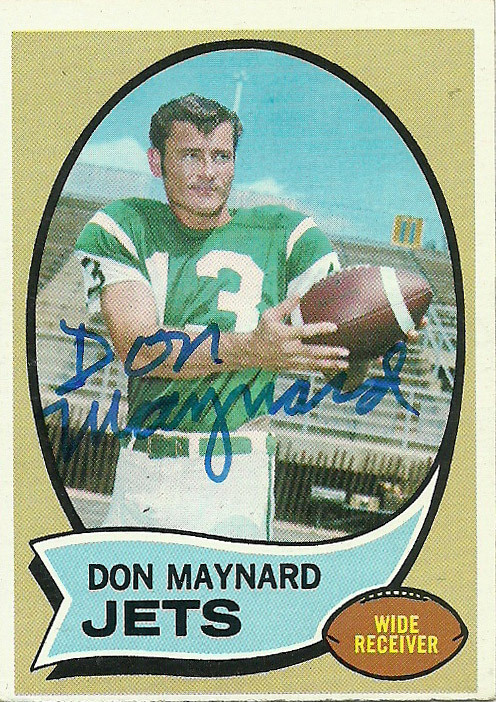 Don was selected by the expansion Atlanta Falcons in 1966 where he grew into starter material until he was traded to the Saints in 1969. After two seasons blocking up front for New Orleans, Don was traded again- this time back to Dallas. Talbert played for the Cowboys through 1973 and won a Super Bowl ring (VI). 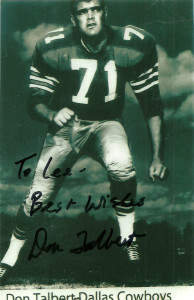 Don joined the upstart WFL in 1974 as a member of the original Houston Texans. (The franchise did not last the year and moved to Shreveport where it was renamed the Steamer.) He’d retire after the season concluded. 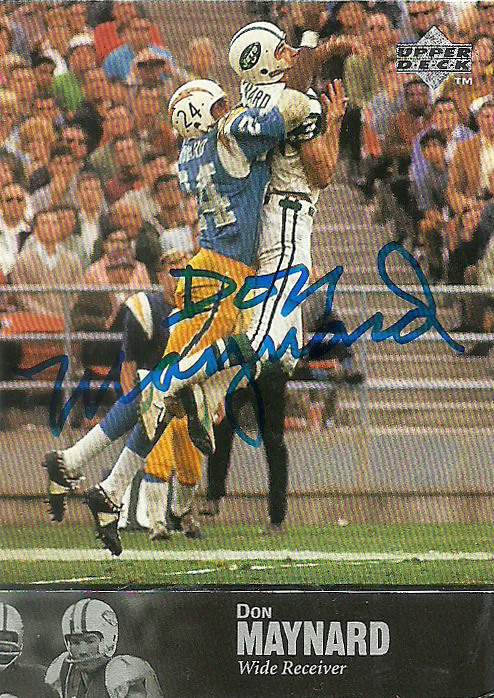 Don signed this UT card of his in a very short time. He also mailed me this signed photo memorabilia as well. For a while there after football Don was owner and president of Talbert Investments- specializing in real estate out of Houston. *Donation suggested of $10 per flat. Okay, so I’m fine with paying a small signers fee for an autograph or two. I’ve gotten to that point in TTM collecting that I’ll indulge myself from time to time on that, but there are two things that get on my nerves. First and foremost, I expect it to be an authentic signature from the player- not an autopen or ghost signer. (I heard OJ Simpson had done this during one of his many legal battles. He will take your money, however much or little it is, and then hand it off to a ghost signer.) It’s got to be legit and consistent from piece to piece (see Ottis Anderson). Second and finally, when you cash my check, it tells me: “I acknowledge I have received your item and I have completed my end of the transaction,” – namely signing my cards. Having me wait an additional 2 months after that? That’s a bit egregious. I understand if a player has personal problems they are dealing with; That is no problem, but really, the whole turnaround should be more like 2 weeks tops. Anyway, case in point, on the second peeve is right here in Kenny Stabler. Don’t get me wrong. I’m happy to have the autograph, but out of fear of the ‘mail gods’ voracious appetite, I had to consider cancelling the check and getting new cards to send. Much more hassle than what it was worth, especially if I just wanted to take a chance that he’d sign it without a donation. Kenny Stabler followed in the footsteps of Broadway Joe Namath at Alabama during the mid-60s, where Stabler carved his own legacy into the Crimson Tide leader books, posting a 28-3-2 record as a starter. He finished 180/303 for 2196 yards, 18 TDs to 18 int, 838 yards on the ground, and 9 touchdowns, all in a little over 2 years as a starter. The gruff quarterback was drafted in the 2nd round of the 1968 NFL draft (- the second such common pooling of players between the rival NFL and AFL that has now become the norm,) by the Oakland Raiders. Unable to crack the lineup, he found himself playing in the Continental Football League for the Spokane Shockers to pass the time. Things started off slowly for the West Coast rock star QB, as he had to unseat incumbent Darryle Lamonica first. By 1973 however, The Snake was in charge full time for the Raiders, and in 1977, the Silver and Black won its first Super Bowl. During this period the renegade qb flirted with the idea of joining the fledgling WFL and the Birmingham Americans (but the league suffered serious financial setbacks and was unable to last past the 1975 season). Stabler reached a point in his career where he was basically the West Coast version of Joe Namath- except The Snake was considered a rock star. Things were at their zenith for the Raiders after their Super Bowl win, as Stabler became the fastest quarterback to 100 wins with his penchant for miracle plays and comebacks that were legendary. A prolonged holdout and subpar play doomed his tenure in Oakland, so in 1980, he was traded straight up for Dan Pastorini to the Oilers. 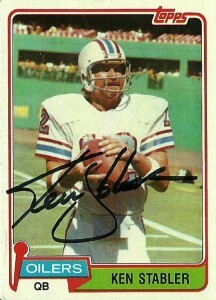 From the Raiders to the Oilers wasn’t such a bad leap for Stabler. Working with Earl Campbell and coach Bum Philips wasn’t such a bad thing either, but the Oilers failed to advance in the playoffs that year, so owner Bud Adams, (who couldn’t keep a good party going if it hit him in the mouth,) fired Philips after the season. The Oilers stumbled into mediocrity under embattled head coach Ed Biles so the Snake took his game after the 1981 season to the New Orleans Saints, where he was reunited with Philips, for the final 3 injury plagued seasons of his career before he retired in 1984. Stabler has remained popular in football circles, both as a Raider and as a member of the Crimson Tide. He’s spent time in the broadcasting booth and done a lot of charity work through the XOXO Stabler Foundation. He’s had some legal run-ins with the law over back taxes, and besides having his own drink briefly (called Snake Venom,) Stabler has also dabbled in wine making. One can make an argument for Kenny Stabler needing to be in the HoF, based on his accolades as the 1974 NFL MVP, a Super Bowl champ, 4 time Pro Bowler, 2 time AP, part of the NFL All 1970s team, and for basically owning all the Raiders record book after he left the team, but at this time, injustice remains done, and the honor has escaped the renegade Snake. Ken Stabler passed away quietly at the age of 69, surrounded by friends and family on July 9th, 2015.